In loving memory of Tommy Leonard. The great Tommy Leonard passed quietly from our midst yesterday at JML Care Center in Falmouth, Massachusetts at age 85. The beloved founder of the Falmouth Road Race and long-time bartender at Boston’s legendary Eliot Lounge, Tommy was the patron saint of running to thousands of people around the globe. Tommy’s dear friend Russ Pelletier sent the following note last night. “Just want to let you know that he never lost his sense of humor. I was with him yesterday afternoon. It was obvious that he was at the end of the line. Around the bed were three women on the JML staff and myself. He was having difficulty breathing and couldn’t speak. But we knew he could hear us. So I told him, “Tommy, no matter what the situation, you always have young ladies taking care of you”. I couldn’t hear his reply, but the nurse closest to him did. I asked, “What did he say?”. She looked at me and said, “I have the best seat in the house”. Thanks to Russ for bringing one last Tommy-made smile to our faces. Those who knew him well loved him dearly, not just for a shared love of running, but for his selflessness and generosity of spirit. Even those who had never met him felt like they knew him from the stories they’d heard. Such was the effect Tommy had on people, a best friend you might not have ever met. TL’s contributions were incalculable, and not just to the running community. He and fellow Back Bay barkeep at the Bull & Finch Pub (the Cheers bar on TV) Eddie Doyle raised funds for causes far and wide through the years from their posts behind the hardwood. 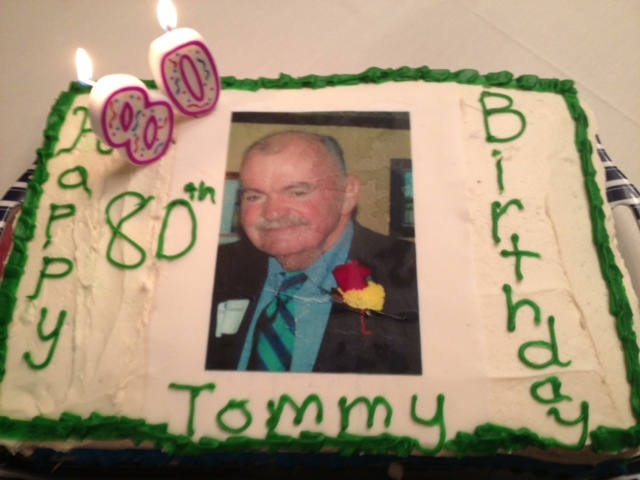 And though he had grown up in an orphanage and foster homes in western Massachusetts, Tommy created a worldwide family with his Irish glint, zest for life, and an embracing you-centered concern. Like a human endearment machine, Tommy worked perfectly all the way to the end. True, he was more of a dreamer than a hands-on producer. But TL was a wizard at bringing the right people together – like John Carroll and Rich Sherman in Falmouth, and Eddie Doyle in Boston – while creating an atmosphere where good times were to be had by all. Today, we mourn his passing from a world where such character and traits seem increasingly anachronistic. It’s with full hearts we send TL off on his next great adventure. Off beyond “the powder-puff clouds and shimmering Vineyard Sound” to make God laugh, angels weep, and more souls that can fit on the head of a pin happy. Bless you, Tommy Leonard, your light and spirit will continue to shine through to show us the way. As we come up upon the 46th New Balance Falmouth Road Race weekend, we also celebrate the 85th birthday of race founder Tommy Leonard. In honor of TL a light verse recalling that other great running institution associated with TL, Boston’s Eliot Lounge. Happy birthday, TL. See you soon. And put PRs on display. With a heart big enough to share. Each one with a telling story. A champion, not a nun. So the prints didn’t quite indent. They and the joint absolutely crammed. Before our youth and speed finally passed us. Sometimes I wish we could turn back the clock. But a good time was at night at Fall Call. ‘Tis the future we must look to and plan. And we called the Eliot our home. And the Eliot our nurturing womb. Good God, it should bring us all to tears. This Sunday the New Balance Falmouth Road Race turns 45. But today race founder and guiding spirit Tommy Leonard celebrates his 84th birthday. Back in the Summer of `72 Tommy was tending bar at the Brothers 4 on Falmouth Heights when Frank Shorter ran to the gold medal at the Munich Olympic Marathon. Inspired by Frank’s win, Tommy dreamed up a local road race to help raise funds for the Falmouth Girl’s Track Club. 45 years later, both the founder and his founding spirit live on. Falmouth, MA. — In the early days of road racing it was not unusual for track athletes to come back from the European circuit to run the Falmouth Road race in August as a season-end topper. The first man to do so was Marty Liquori, the great 1500 meter/5000 runner who was invited by his brother Steve through race founder Tommy Leonard to come run the second Falmouth Road race in 1974 as somewhat of a mini vacation on his way home to New Jersey from the continent. Little did he know that rising local hero Bill Rodgers was trolling area shores ready to meet him head on over the seven-mile Cape layout. It was the Liquori scalp that elevated Rodgers (and the Falmouth Road Race) to stardom in the local media, and began Rodger’s final ascent to international recognition that culminated the following April when he won his first of four Boston Marathon titles in an American record time. Over the years track men like Frank Shorter (1975 & `76 Falmouth champion); Craig Virgin (1979 champ); Rod Dixon of New Zealand (1980 winner); Mike McLeod of Great Britain (silver medalist in the 10,000 in L.A. `84 & 2nd to Al Salazar in Falmouth 1981), and more, came to race along the outer elbow of the Cape at the end of their track seasons. Falmouth, Mass. — 150 to 200 of Tommy Leonard’s best friends surprised him with an early 80th birthday party last night at the Sea Crest Beach Hotel as the 41st New Balance Falmouth Road Race weekend got under way on old Cape Cod. For those too young to know, it was Tommy who founded the Falmouth Road Race in 1973 after watching Frank Shorter win the Olympic Marathon in Munich 1972. During Frank’s gold medal run Tommy watched in rapt attention while bartending at the now defunct Brothers Four on Falmouth Heights. A long-time runner himself, Tommy was so inspired by Frank that just one year later he welcomed 92 starters to the first Falmouth Road Race to raise funds for the Falmouth Girls Track Club. By year three Tommy had lured his hero to Falmouth to take on growing local legend Bill Rodgers. The Shorter vs. Rodgers rivalry on the Cape — Frank won in 1975 &`76, Bill took revenge in `77 & `78 — helped Falmouth become the Great American Road Race which assisted mightily in spreading the running Boom throughout the country.